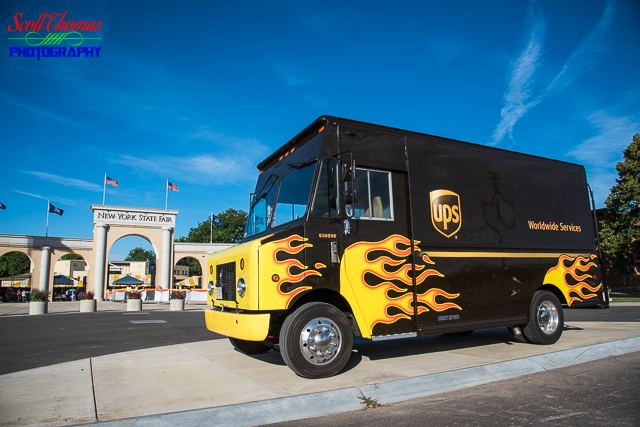 United Parcel Service (UPS) Delivery Truck painted with flames was parked outside the Syracuse Nationals Hot Rod and Muscle Car Show at the New York State Fairgrounds on Saturday, July 21, 2018. Nikon D750/24-120VR, 1/320s, f/9, ISO 100, EV 0, 24mm Focal Length. 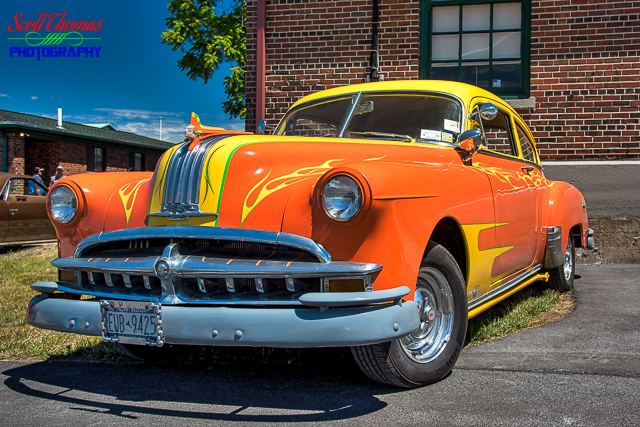 Over 8,000 hot rods and muscle cars visited the New York State Fairgrounds near Syracuse, New York for the 2018 Syracuse Nationals from July 20th through the 22nd. I cannot resist grabbing my camera and spending a day photographing the beautiful cars and trucks. Hot Rods owners love to put flame graphics on their rides. I saw them on a lot of them including the UPS Delivery truck on display outside the Fairgrounds. Inside, I came across The Canadian Kid Ford Hot Rod. Many Canadian hot rod owners come south for this show every year. 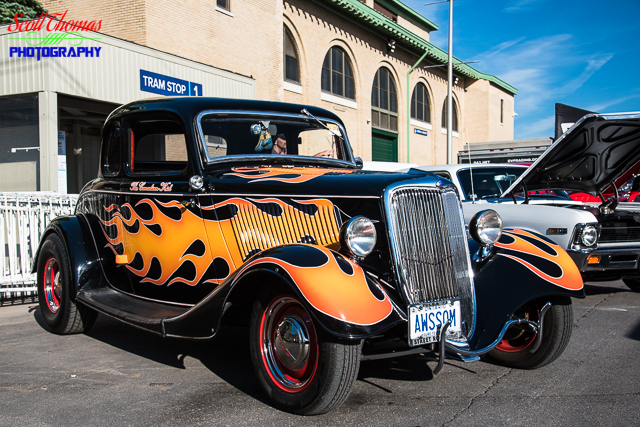 Ford Hot Rod called The Canadian Kid on display at the Syracuse Nationals Hot Rod and Muscle Car Show in the New York State Fairgrounds on Saturday, July 21, 2018. Nikon D750/24-120VR, 1/125s, f/8, ISO 140, EV 0, 38mm Focal Length. 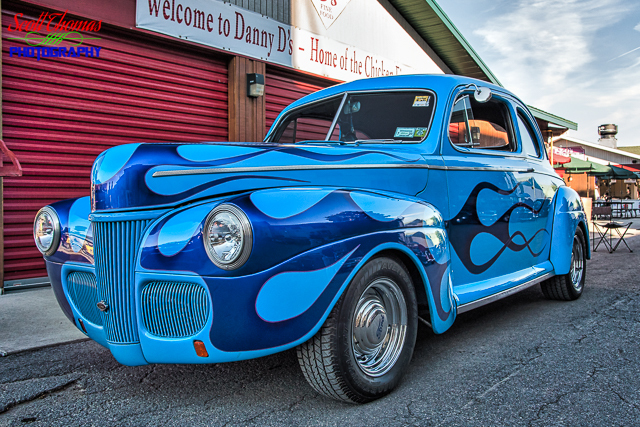 Not too far away, I photographed another Ford Hot Rod in light blue with dark blue flames. The fenders had been smoothed out in this model. 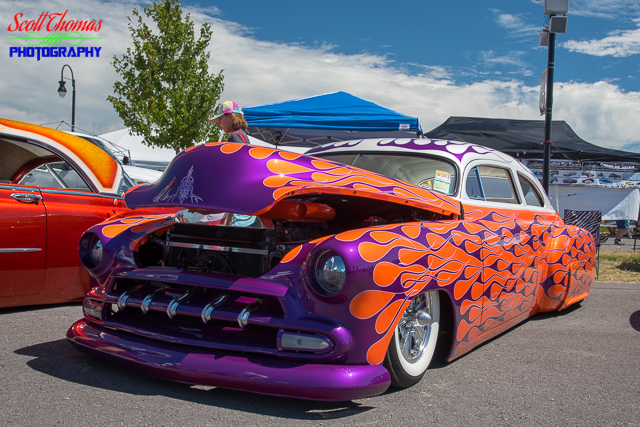 While these first flamed hot rods are beautifully done, these next two feature outstanding paint work starting with this purple and orange hot rod. Hot Rod in the Syracuse Nationals Hot Rod and Muscle Car Show held at the New York State Fairgrounds on Saturday, July 21, 2018. Nikon D750/24-120VR, 1/125s, f/8, ISO 160, EV 0, 32mm Focal Length. An early 1950’s Pontiac Eight with a paint scheme never dreamed of by the original designers. Pontiac Eight Hot Rod in the Syracuse Nationals Hot Rod and Muscle Car Show held at the New York State Fairgrounds on Saturday, July 21, 2018. Nikon D750/24-120VR, 1/125s, f/8, ISO 110, EV 0, 34mm Focal Length, Intensify CK. When walking through the Syracuse Nationals, is it impossible to see all the cars and I only have time to photograph a fraction of them. To get a sense of the size of the event, a friend of mine gave me permission to share a photo he took of the Fairgrounds the same day I was there using his drone. 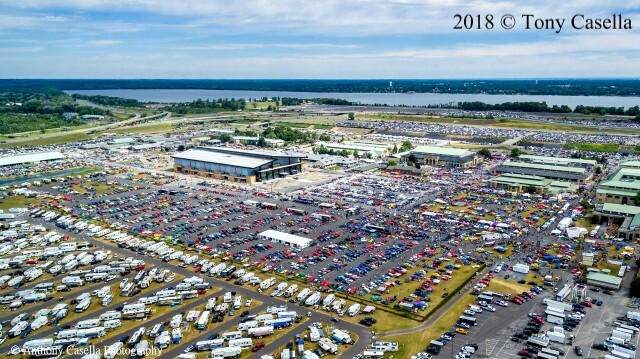 Aerial View of the Syracuse Nationals held at the New York State Fairgrounds near Syracuse, New York on Saturday, July 21, 2018. You can see more of Tony Casella’s drone work on his youTube channel (click the link). This entry was posted in Event, Travel, Weekly View and tagged 2018, 24-120mm, aerial, cars, drone, fairgrounds, flames, ford, hot rods, new york, nikon D750, pontiac, syracuse, syracuse nationals, trucks, ups, vr. Bookmark the permalink.